This weekend The Observer published a list of the top 50 cookbooks ever. Compiled by regular Observer Food Magazine contributors and a host of well known chefs, it made for interesting and (as many books in the selection I had never heard of and I am always open to a new cookbook suggestion) potentially expensive reading. Now, I’ve just moved house and can frequently be found gazing at the lovely new space I created to host my own collection of cullinary tomes. Decided to put this gazing to good use, follow The Observer’s example and list my own favourite cookbooks. The Observer’s aim, it seemed to me, was to recognise a selection of ground-breaking/original/esteemed publications. Fair-do’s. My list is a bit different. The following ten cookbooks might not in some cases be unique or critically admired and they really don’t make for a spectacularly exciting list but they have been my most used, most beloved cookbooks in recent years. And that’s what I wanted to share with you. Novel sized, unfussy and without pictures, this was one of my first cookbooks and it is still a firm favourite. So many simple ideas. If I find myself with the bare minimum in my cupboards/fridge or if I’m a bit tired or if I can’t remember how to make the perfect omelette (I forget), this is the book I turn to. It’s like the Mary Poppins’ bag of cookbooks. Every time I open it, I find something different and delightful. Huge. Encyclopaedic. Classy. There are larger Madhur Jaffrey books (including the fab World Vegetarian) but I really like this little book. It has all her classics along with some staples and stunning side dishes. I don’t actually use this cookbook very much any more as I know lots of the recipes by heart. It had to be on the list though. David gave me this for our first Christmas as a couple and many of the dishes have become staples in our household. The pasta recipes in particular are spectacular. Nigel? Twice?! Well, yes. He’s wonderful. I gave this book to a friend of mine in Finland last time I visited (three years ago) and when I returned this summer it was still sitting on her bedside table. Before going to sleep each night, she reads what Mr Slater made on that day of the year. I’d do the same but my own copy is splattered with a vast variety of liquids, crumbs and gloop. Think it smells a little too, so much has it been used. Simon Hopkinson disappointed me greatly with his vegetarian cookbook. It was so utterly bland. Yet, both of his Roast Chicken books are fabulous so I forgive him always. Everything I’ve made from them has turned out perfectly. Possibly because his instructions are so meticulous. Not an every day cookbook. This is the book I cook from when I have a whole afternoon to potter about in the kitchen. There are some cracking basic recipes but my favourites are the stylishly fussy dishes with multiple elements and paragraph sized names. An Aussie Jamie Oliver, I think. Big flavours, easy recipes and big on the inclusion of vegetables. Again, many of his recipes I know by heart and are eaten frequently in this house. Another Australian. An enormous book featuring all of the most common main ingredients in a cook’s kitchen. Endless recipes under each section and, rather cleverly, a list of other ingredients that compliment the featured food. I’d love to visit Sarah Raven’s garden sometime. She grows the most amazing fruit and veg. Her cookbook is based around the seasons and the produce from her garden. The pictures are beautiful and the recipes make me want to cook for others. Oh, definitely The Kitchen Diaries. I love it so much. It’s the most gorgeous book to dip into, either for inspiration or just a lovely, soothing read. Nigel writes so well about food. His column is always the first thing I turn to in the Observer … before David Mitchell even, and I love David Mitchell. Jamie’s Dinner’s is a staple in our house too. It’s the first one I turn to if I’m at a loss. I also love Nigel Slater in the Observer but have yet to study his books as meticulously as I would like. I think I may have to make a point of getting the ones on this list! Thank you for some great cook book tips. I follow Nigel in the observer and I recently bought Real Fast Food but you have now tempted me into buying Kitchen Diaries. One of my favourites for healthy vegan recipes (not that I’m vegan) is ‘The Great American Detox Diet’ (the thai protein noodle salad is fab) and my first ever cookbook which I still use from time to time is Sarah Browns vegetarian kitchen. For cakes I thank the lord for Mary Berry’s ultimate cake book, I couldn’t do the school fundraising cake stall without her. When’s the ‘A Wee bit of cooking vol 1’ hitting the shelves?! I love Stephane Reynaud’s Ripailles. My brother gave me it as a christmas present last year and it’s always amazing to just open it up and flick through the pages for an idea. The recipes aren’t precise, but they’re mostly uncomplicated and the illustrations and other inserts are brilliant with a lot of humour spread throughout. It’s been a great source of cooking inspiration! What a great list! There are a few on here that I’ll have to add to my own collection, methinks. I have the Sarah Raven book, and it is a great idea-starter when I just don’t know what to do with whatever came out of the garden. For cooking meats, I just cannot go wrong with All About Braising, by Molly Stevens. It is excellent. Other go-tos are The New Spanish Table, by Anya von Bremzen, Sunday Suppers at Luques, by Suzanne Goins (dreamy meals), and The Zuni Cafe Cookbook, by Judy Rodgers. The Zuni Cafe is an absolute winner–you can’t go wrong with that one. I’m looking forward to seeing what others suggest too! Note to self: visit the library to check out Wendy’s cookbooks. I have none of these so my faves are: The River Cottage Handbook: preserves, Sensational Preserves (spot the theme there! ), Cranks Fast Food, World Food Cafe and the Ministry of Food: thrifty ways to feed your family. Crazy Water, Pickled Lemons by Diana Henry is grand, both to look at and read, especially her evocative intros to each chapter. But really? I love them all. Currently loving (and laughing at) my original 1984 copy of Barbara Cartland’s “Romance of Food”. Hilariously photographed and styled by Babs herself, using all of her own 18th century props – and lots and lots of pink. Love your list…so similar to my own, but then that doesn’t really come as a surprise! What a nice cooking book list! I’ve been toying with the idea of buying “Jamie’s Dinners” as I already have “Jamie at home” (which I love, by the way). I think I’ll buy it! Another one of my favourites is (not wanting to repeat myself, but I do love Jamie Oliver’s passion for food) “Ministry of Food”. I bought it for a friend who is just starting to experiment and learn in the kitchen, and it has really inspired her to be more brave and venture beyond “Spag Bol”, etc. I often wonder if Stephanie Alexander and Nigel Slater (oh and Mark Bittman) had a culinary love child – what the book would be! Am sure it’d be my favourite. Sarah Ravens sounds interesting. Already have a huge haul of requests in at the library for books from the top 50 that looked interesting. My new favourite is a local one (Melbourne) Tony Chiodo’s “Feel Good Food” – its healthy yet lush. O M G – not 50 more cookbooks that I don’t own!! I’m off to peruse the whole list and try not hit the “buy” button on anything. Here are two pages from my blog about my obsession. I need to update my collection of Southern U.S., Soul Cooking, Cajun and New Orleans cookbooks page. I have many more, and one of my favorites right now is the Black Family Reunion Cookbook. What about Claudia Roden? Her book of Middle Eastern cooking is a firm favourite. I also like Jane Grigson’s vegetable book. Stephanie Alexander is a great reference book and always a good starting point. But my all time favourite is Margaret Fulton, her recipes are varied and well described. It is impossible to have a failure if you follow her instructions. 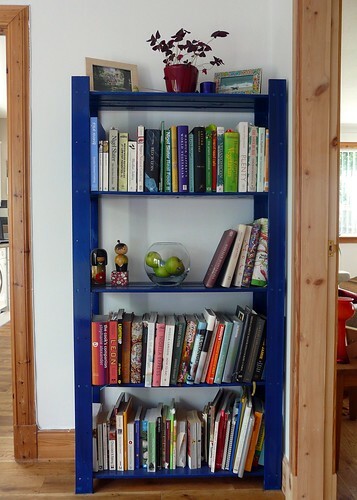 I think I’ll need to do a ’10 Favourite Cookbooks’ blogpost of my own – so many books, so little time……. I am so glad I stumbled upon you blog. I can almost smell the food. Makes me think about my childhood and my Dutch mother baking apple tart…the DUTCH WAY, Oli Ball and Marbles cakes. Five star!!! recommending you on my blog. Many of your top 10 would also appear in my list, however my number one (at the moment) would have to be Hugh Fearnley-Whittinghstall’s ‘River Cottage everyday’. Some really great recipes for everyday specials! Just discovered your blog and I love it – I’ve added you to my favourite sites on my blog..
Betty Crocker’s Cooky Book is my go-to book for sweets.